While the current Huskers are ramping up for spring football to begin on Friday, some of those who have exhausted their eligibility or chosen to move on took to the weight room and practice field to show off their abilities at Nebraska’s Pro Day. Eleven players who just wrapped up their Nebraska careers plus four other former Huskers took part in the pro day as scouts from 26 NFL teams and three CFL teams showed up in Lincoln to get a look at the former Huskers. All five Huskers who participated in the NFL Combne — Tanner Lee, Nick Gates, Drew Brown, Chris Jones and Joshua Kalu — took part to varying degrees while fullback Luke McNitt, tight end Tyler Hoppes, safety Kieron Williams, offensive lineman David Knevel, linebacker Marcus Newby and wide receiver De’Mornay Pierson-El participated as well. Tommy Armstrong Jr., Daniel Davie, Josh Banderas and Mohammed Seisay rounded out the crew of Huskers. For those that weren’t fortunate enough to receive a combine invitation, the school’s pro day may be a player’s only chance to catch the eye of a scout or two. Former players including the likes of Brandon Reilly and Nathan Gerry and many members still on the team crowded around the athletes as they went through their lifting and vertical leaps and filled the balcony above the practice field, cheering their former teammates on. McNitt, a tight end-turned-fullback who got few touches during his time at Nebraska, had a strong day in the weight room, pumping out a pro day-leading 26 repetitions of 225 pounds (which he was disappointed in) and showing off a 34 inch vertical. McNitt’s 40-yard dash time was unofficially in the 4.6 range as well, a solid number for a fullback. That athleticism could make him appealing to professional teams as a special teams contributor. Hoppes, Nebraska’s starting tight end last season, was said he was happy with his performance. Hoppes only managed 16 reps in the bench press, but he jumped 33 inches and looked pretty fluid as a receiver during drills. For cornerback Chris Jones, the pro day was a chance to finish what he started at the combine as he cramped up during testing and wasn’t able to complete the drills. Jones recorded a 34.5-inch vertical and a 10-foot-1-inch broad jump and put up a similar time in the 40 to what he ran at the combine, unofficially in the 4.5 to 4.6 range. 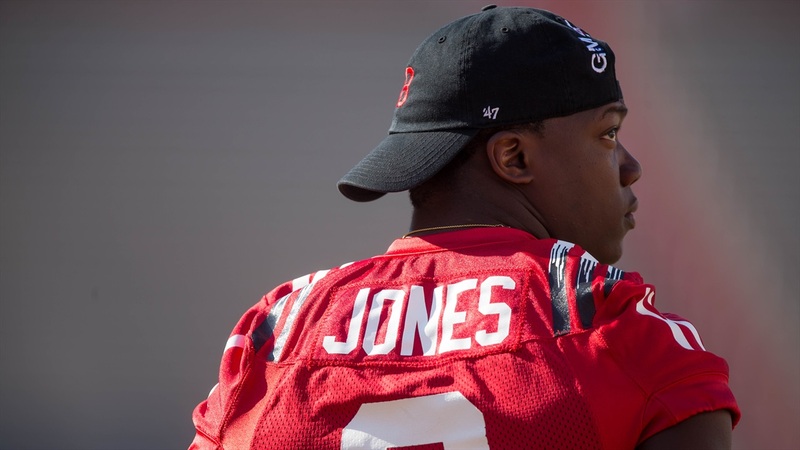 Jones lost much of his senior season to a knee injury, but he said it checked out under the scrutiny of several doctors in Mobile for a hectic combine week. Jones said he’s back to full health and isn’t worried about the knee any more. Jones said he doesn’t regret returning to the field as soon after surgery as he did during his senior year. Lee was there but chose not to participate in any of the testing after doing so at the combine. His pro day was all about putting his arm on display for the collection of scouts. Hoppes said Lee and his receives have been working together since the quarterback returned from the combine, determining which routes to include and further building up chemistry. Lee completed 43 of his 49 passes, the last of which was a bomb up the right sideline that the receiver hauled in. Lee and his receivers were all on their own in terms of coming up with and executing the plan for Lee’s throwing session, but Lee said former Nebraska offensive coordinator Danny Langsdorf has still been a big part of his draft preparation. Brown was another player who attended the combine but didn't do any athletic testing. He passed on that portion of pro day as well in favor of showing off his leg with some field goals and kickoffs towards the tail end of the day. Brown knows spots for his position are limited. Brown has a very good resource to rely on as he seeks an NFL career — his brother Kris, who played 12 years in the league and has been giving him some advice. The NFL Draft is set to begin on April 26 and runs through April 28.